This black bean recipe was originally posted in October 2015 and has been updated. Recently, hubby had a work trip to Texas for a couple of days. I always love to ask if he had any memorable meals or dishes. I’m allll about the food, lol!! Tell me. Tell me in detail!! During his trip he said that black beans were a really common dish that was served and he loved ’em. Because both of us are big fans of beans, I knew I had to make some myself! I’ve made baked beans before (Homemade Baked Beans) and they are completely delicious, but these smoky baked black beans are different altogether. 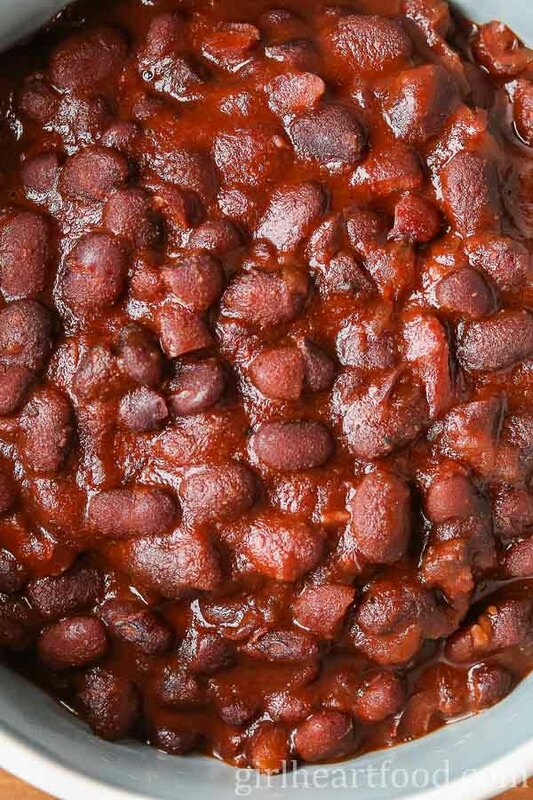 This recipe is a tad simpler and has a different flavour profile than my other baked bean recipe – it has more of a spicy/smoky flavour from chipotle powder and smoked paprika, it’s not tomato based and uses a different type of bean. What Goes in this Chipotle Black Bean Recipe? What are Black Turtle Beans? Black turtle beans are small shiny beans popular in Latin America (and parts of the United States) and are often referred to simply as ‘black beans’. They’re dense and mealy, which is why they work great in hearty vegan and vegetarian dishes, like this vegan black bean recipe. For this recipe, turtle beans were the bean of choice for me. They are really high in fibre (29 grams per cup! ), which makes them extra nutritious (and who doesn’t like a little extra fibre in their diet?). Find them in your grocery store where you would find dried chickpeas, lentils and the like. Do you Have to Soak Black Beans? How to Soak Black Beans? Yes, soak black beans overnight to use the next day in this black bean recipe. Soak anywhere from 8-24 hours. To soak, simply placed dried black beans in a large bowl and cover completely with cold water. I like to have 2-3 inches of water above the beans because they will expand as they soak. Don’t have that kinda time or forget to soak and you really want to make this recipe? No worries! Try this quick-soak method from The Kitchn. How to Cook Black Beans Using Black Turtle Beans? 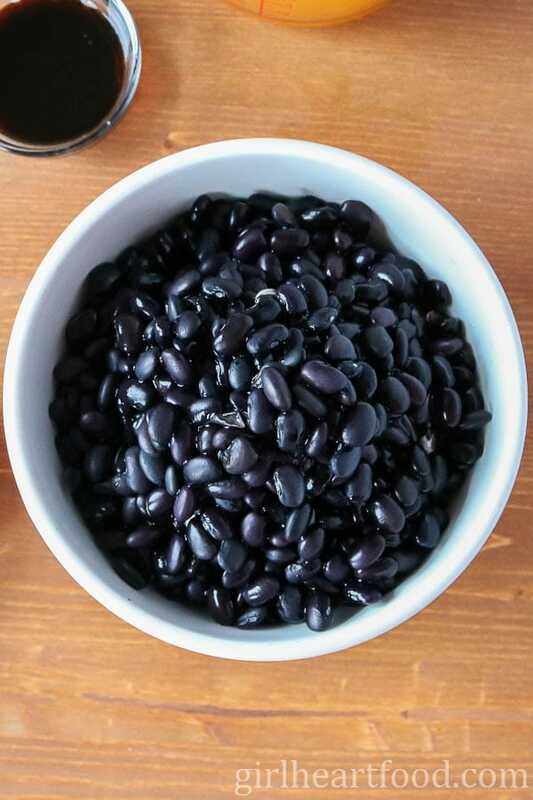 Aside from soaking the black turtle beans, this healthy black bean recipe is super simple! You just need a little time and patience for them to cook (but the taste is so worth it)! To pot add remainder of ingredients. Stir to combine. Cover, place pot in oven and cook. Half way through cooking, carefully remove black beans from oven, add more water. Stir and make sure beans aren’t sticking. Cook remainder of time. 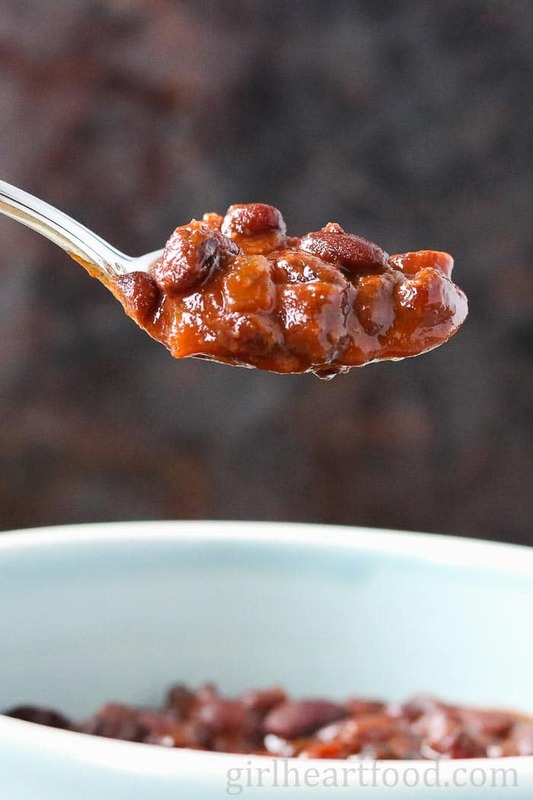 When beans are finished cooking, stir in more water to loosen and add a little more bbq sauce. Cooking time is about 5.5 to 6 hours. Adjust seasoning, if necessary, and remove bay leaves. Portion and enjoy! Psssst—> I love a little squeeze of lime over top! Don’t skip soaking the black turtle beans overnight! This cuts down on the cook time. This black bean recipe is plant based and tastes scrumptious as it is. However, if you like, you can add a leftover ham bone into the pot. Once the beans are cooked and the bone is cooled slightly, pick any excess meat from the bone, shred, and add to beans. Don’t have a ham bone? Crispy bacon works as well. Prefer as they are? That’s cool too! You do you! Depending on how ‘loose’ you want these beans add as little or as much water or stock after they’ve cooked. Upon reheating, add a little stock or water to loosen. Garnish with cilantro, a squeeze of lime, avocado or crumbled feta. Yep! Hubby and I love to portion cooled leftovers into vacuum seal bags, seal, and throw in the freezer for when we are looking for a healthy, quick dinner. Don’t have a vacuum sealer? No worries! Use freezer safe bags or containers. Thaw when ready to enjoy! Enjoy as is and garnish to taste! Like most bean recipes, this easy black bean recipe is really inexpensive to make…some beans and a few other ingredients yields quite a large amount. Though this recipe is quite humble and most definitely not fancy, it is pretty versatile; you can enjoy with just about any meal from breakfast to dinner. Hope you love this healthy black bean recipe using dried turtle beans! They are a fabulous recipe for meal prep for easy weekday meals. Soak beans in a large bowl of water overnight (ensure beans are completely covered and water is at least two inches above the beans). Preheat oven to 350F. Using a slotted spoon, remove beans from water. In a dutch oven (about 4 quart), place beans. Add oregano, garlic, bay leaves, chipotle powder, smoked paprika, chili powder, tomato paste, bbq sauce, stock, molasses, onion and pepper. Stir to combine. Cover and bake for 3 hours. After 3 hours, carefully remove pot from oven and add 1.5 cups of water. Stir. Place back in oven. Cook for about 2.5-3 hours more. Carefully remove from oven and add another 1/2 cup or so of water (depending on desired consistency) and stir to combine. Stir in 2 more tablespoons of bbq sauce. Stir in salt and adjust to taste, if necessary. Remove and discard bay leaves. I love serving up and squeezing a fresh lime wedge over top. Enjoy! Don't skip soaking the black turtle beans overnight! This cuts down on the cook time. This black bean recipe is plant based and tastes scrumptious as it is. However, if you like you can add a leftover ham bone into the pot. Once the beans are cooked and the bone is cooled slightly, pick any excess meat from the bone, shred, and add to beans. Don't have a ham bone? Crispy bacon works as well. Prefer as they are? That's cool too! You do you! Depending on how 'loose' you want these beans add as little or as much water or stock after they've cooked. These baked beans are delicious served with cilantro, a squeeze of lime, avocado or crumbled feta. You can freeze these black beans! Portion cooled leftovers into vacuum seal bags, seal, and throw in the freezer for when we are looking for a healthy, quick dinner. Love your idea of serving these for brunch with a fried egg on top! I think I’ll add extra bacon to mine too. Looks delicious! Sounds good 🙂 Thank you so much, Renee! I love black beans with chipotle – and adding paprika gives them another whole layer of flavor! Just perfect! Beans at our house are always a hit! I have a hard time changing them up because I cannot find a recipe! I am so glad I found this recipe! The spices in here sound so good! And with the oven on all day, this seems like such a perfect fall dish to keep the kitchen and the belly nice and warm. Thank you Julie! Love dishes like this, especially in the fall! Nothing beats a pot of beans to make the perfect side dish. I love the smoky sauce and the different turtle bean you used for this. I really like baked beans, especially as part of summer picnic menus. 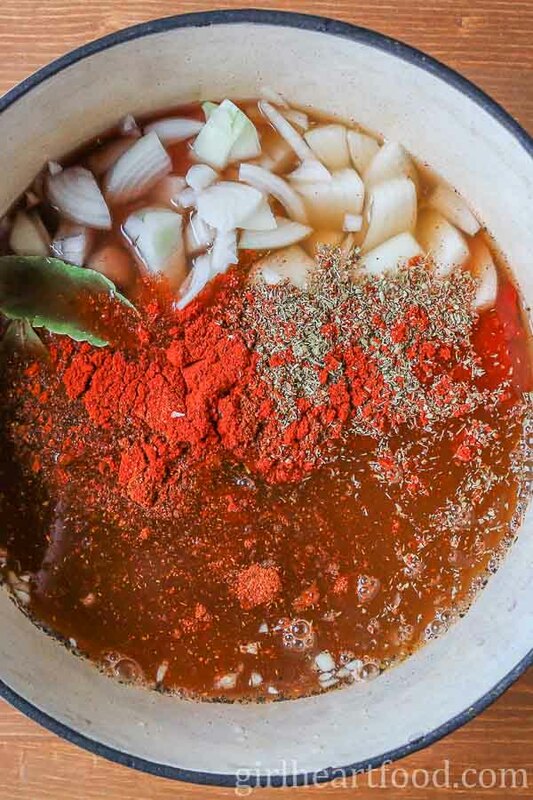 And I love so many things about this specific recipe – the unique choice of beans and all the layers of flavor, not to mention the gorgeous photos and great little tips. Terrific recipe post! Thank you so much for the kind, thoughtful comment, Shelley 🙂 So happy you enjoy it! I love a good bowl of beans. I have never heard of turtle beans, but will be on the lookout the next time I go to the store. I can’t wait to try this recipe! Oh, what a yummy dish! We love all kinds of beans, especially black beans. I haven’t seen the turtle beans — of course they could go under another name. This is a definite must make recipe. And I’m a lot like you, whenever anyone says they ate something in particular that they like I want them to describe it in detail. Haha – glad I’m not the only one 😉 Thank you so much, Marisa! Im so glad you republished this one, Dawn! 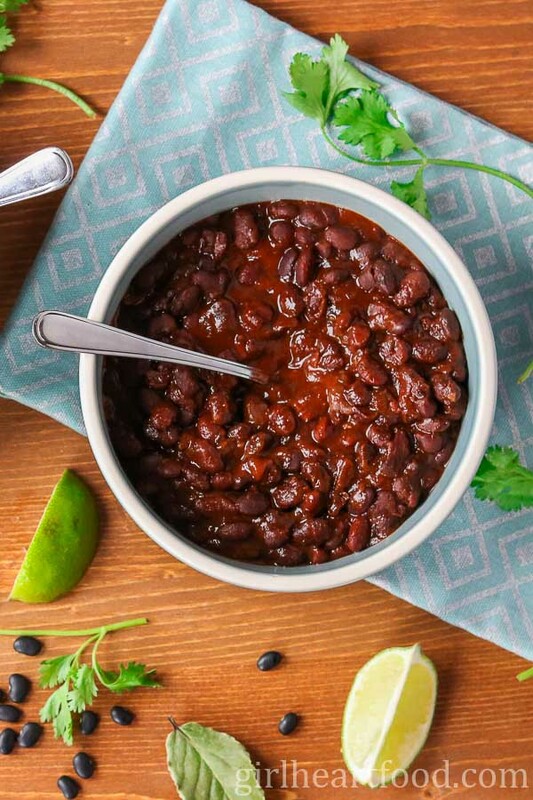 TBH I didn’t know there was such a thing as black turtle beans until I read your post – love that they are higher in fiber and LOVE this spiced smoky rendition of them! Sounds so delish! Oh I loved this bean recipe Dawn! Lovely flavors and spices used,looks so yumm. Thank you Prasanna 🙂 !! The flavors are amazing and so delicious! Thank you so much, Eileen 🙂 ! Yum! Love the idea of ‘smoky’ beans!! And really like the possible addition of a ham bone to infuse flavour! SO GOOD! Thanks Lizzy 🙂 They are pretty delish! Hope you get a chance to try them soon! OOOoooo these beans look good!! I love the spice used here; it really kicks the recipe up a notch! This recipe makes me realize that I do not eat beans hardly enough. I can’t wait to make these! We love black beans. They are so nutritious, and a great alternative to meat. These beans look so good. Love the switch up from regular kidney beans. This is perfect for comfort food season. Your black beans are different and delicious sounding. Perfect for the upcoming holiday. Thank you Karen 🙂 They sure are! Have a good one! Dawn – I’m loving these beans! And you are right, they are so inexpensive and are packed with all kinds of great nutrients. These beans look so lovely! This dish looks soooo good – I am a huge fan of beans too as is my husband, so this is right up our alley! Great for some comfort food that is soon needed, the summer has already disappeared here in London and it already feels like autumn these days 🙁 Don’t get me wrong I love Autumn but not necessarily when it is still August 🙂 Have a great weekend ahead, Dawn! These beans look so hearty, smoky and flavourful Dawn! They are always a must at big family brunches! I’ve never used black turtle beans in baked beans. Love the deep, rich colour they create. Hope you’re having a great week friend! Thank you Leanne! They’re super hearty and those beans pack quite a nutritious punch 🙂 Hope you’re having a great week too! Ever since I have seen these on insta, I was dying to read your blog post Dawn! I am loving the sound of that smoky touch you added to them. Dawn, I love black beans, but I guess the ones I buy are not “Turtle Beans”? I think these sound so delicious! I will be looking for turtle beans to make a big batch of these – they would be excellent on a taco salad. I also love the idea of serving them with polenta, thanks for the recipe! Thank you very much, Laura 🙂 Taco salad? Yes! They would be a yummy addition for sure – love it! Have a wonderful week! It sure is! Gotta love comfort food 🙂 Thanks Sarah! Your beans are beautiful – i love the red color! 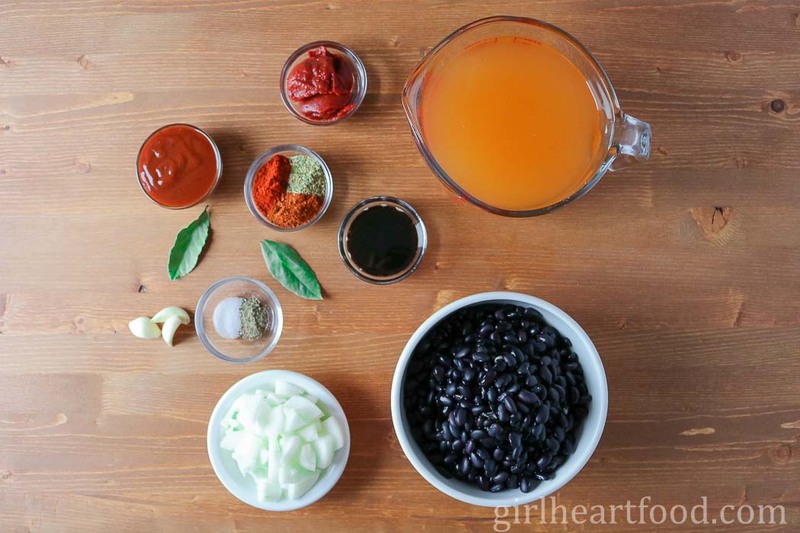 Black beans are a staple in my pantry, and they’re so inexpensive. All beans helped me out during our “poor” years! I have breakfast on my mind right now and I can totally eat a big helping of these as part of a traditional English breakfast. Or simply with two fried eggs on top. Mmm. 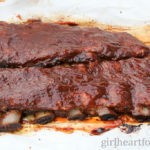 I think that they will be perfect – who can resist paprika and chipotle smokiness? And all the sweetness from the BBQ and molasses? Wouldn’t that be yummy?! Now you’re making me hungry 😉 Thanks Milena! You had me at smoky! These beans sound delicious, Dawn. I’m not familiar with turtle beans, but I do love a good traditional black bean. I love making BBQ everything around here, and these smoky black beans would be such a good side dish! Sounds delicious, my friend! Haha! I knew it 😉 Thank you David…it sure would make a lovely side dish! Have a great week, my friend! I LOVE beans! Especially black beans! These look so hearty and delicious. And is it weird that I really like the color of the final dish? I don’t think I’ve ever thought that about baked beans before :). Have a great week, Dawn! Eee! I love black beans! Smoky- spicy black beans? NOM NOM! I could pair these with everything! And devour with abandon! So yum!!! Cheers, girlie! Me too, Cheyenne 🙂 Thanks so much! I was really pleased with the end result…don’t mind eating extra ’cause they’re so good for you! Hubby and I were eating them straight out of the pot as soon as I took them out of the oven, lol! !